Christmas came, it went and I'm left with a metaphorical and a slightly literal holiday hangover. However, I'm also left with a few gifts that I that I will always look at with reverence as I remember Christmas 2012. 1. 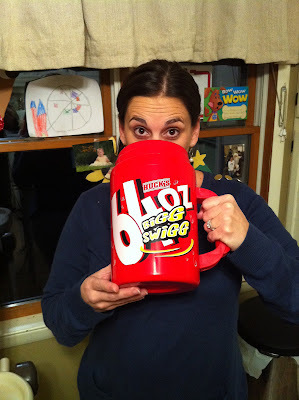 From my husband......A 64oz Big Swigg Cup. Yeah, I like fountain drinks but I wouldn't be caught dead hauling this thing around. 2. 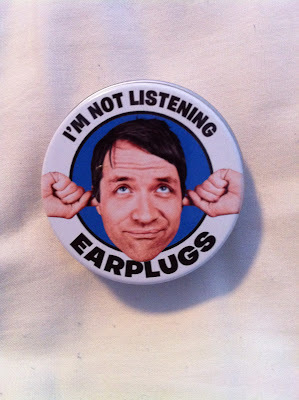 From my father-in-law.....A pair of ear plugs and a cupcake-shaped stress ball. I'm pretty sure this speaks volumes about my life. PS. The cupcake shaped stress ball was swiped immediately by the girls - haven't seen it since. 3. From my daughter....A mallard. 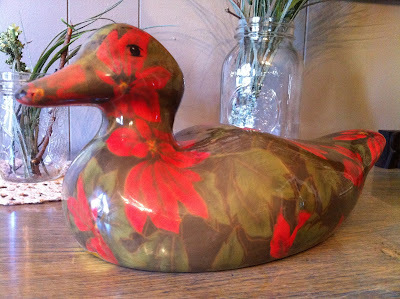 And not just any mallard, but a porcelain mallard with a poinsettia print. Now, that is going straight to my mantle. I have always believed that it is the "thought that counts," that is unless you have crazy thoughts that might persuade you to by someone a Big Swigg for Christmas and in that case, perhaps, you should give gift cards. Disclaimer: As to not totally humiliate my husband, I would also like to disclose that in addition to the Big Swigg he also bought me many other perfectly acceptable Christmas gifts, like a remote starter for my mini-van. So, with luck, there will be no more frozen van doors, seizures or traumatized children in this new year.